Oliver here. Since today is Purresident’s Day I found myself reminiscing about my run for Alpha of the Kitty Kat Pawty. It was a great ride, I worked with my feline staff to purrrfect my purrlitical platform (at the time I threw my straw hat into the ring, I was only a kitten) so the advice of those older and wiser was greatly needed. Tucker offered some sage advice, stating that if a candidate would guarantee a catio on every front porch, a home and food for every feral cat and a bird feeder in front of every window (kitty cable) that cat-i-date would receive his vote. I no sooner began my campaign when I discovered my feline competition, Limberbutt McCubbins. As I purrused his platform I found areas where we agreed and other areas of great difference. For instance, McCubbins’ passion for homeless felines is one I share. I was disturbed however, on his support of a return to cat space flights. Never in my wildest kitty dreams have I thought hurling hapless felines into space is a good idea. My furry campaign manager was quite pleased to announce my running-mate, a sage and beautiful feline named Olive from Three Chatty Cats. Olive brought some new ideas to the campaign. She advocated for an official “Tortie Day” and promised to organize “Tortie Tuesdays”. She focused on homeless kitties and wants to see more clicker training in shelters for felines. She also promoted a mandatory “Tuna Day”. All sound ideas that all felines could get behind. All in all it was a great run. I gave what I felt to be an excellent concession speech and made it clear that I have not given up my purrlitical aspirations. Will I run for purrresident again? I haven’t decided but I can assure all my cat-stituents that there will be some purrlitical campaign in my future. As I look at my options I am incorporating a strict regime of rest and reflection. I leave you with my campaign slogan and wish you all a great Purresident’s Day! Alberto here. My purrsonal assistant decided to exercise her artistic side and entered my photo in the Car Art Blog Hop. She took a photo of me in the garden and then used something called “Color Pop”, she says it’s an “app” but I have no idea what that is. Lily here as your Linky party host. I’ve selected my three favorites from the last Linky Party and have featured them here for your enjoyment. “Sister Precious” writes about sister Saturday. I’ve never heard of this but I like the idea. And, I have to say Precious is one pretty kitty (kind of reminds me of a black and white version of myself). She says she’s 14 and our Tucker and Jasmine are 14 as well. When our humans take good care of us, we can still look good and feel great at 14. First of all just let me say that I love the idea of being a princess…have to have a little conversation with the female human about this. I loved this mewsing about punctuation and the keyboard thingy but I have to say, Erin, just let your human purrrsonal assistant deal with all those pesky things like grammar and punctuation. All we famous felines need to do is provide the ideas and let the humans do the “manual” labor! I acknowledge that canines are more interested in travel than most felines. Although there are some kitties who travel and enjoy the great outdoors like our new friend Jesper. If I were a dog, I think finding painted rocks might be fun but, since I’m a cat, you’d have to make the hunting a bit more exciting. Perhaps bury a bag of my favorite catnip “Meowy Wowy” or some nice stinky fish. 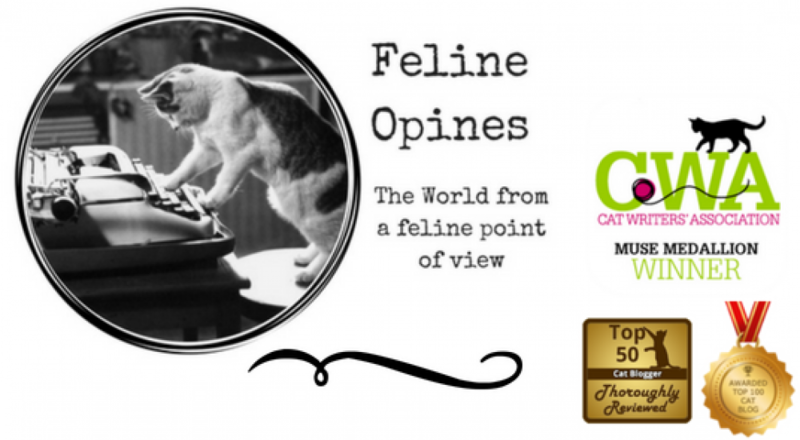 That might get me digging but anything else…meh..
I’m excited to introduce a guest blogger who is writing about feline nervousness. I can most definitely relate to being a fraidy-cat because of the bullying problem I went through (you can read that story here.) We felines have lots of reasons to be nervous, some our humans know about and some may have happened before we came to live with you. 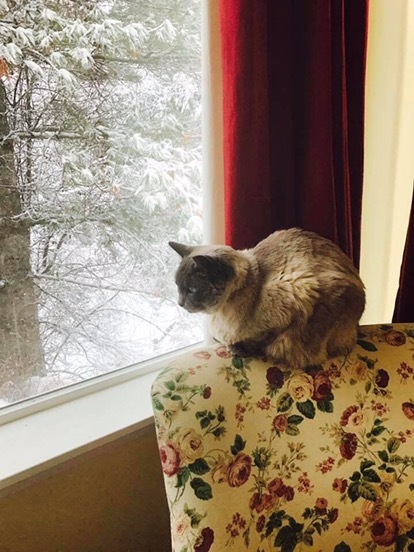 Our guest blogger friend Kevin has some tips to help you and your cat so, without further ado, I’ll turn this blog post over to our human friend Kevin. Cats can be nervous for many reasons and bringing a rescue cat home can be a tine fraught with fear for your new feline. Some indications of fearful behavior are hissing when anyone tries to pet them and hiding. Don’t be discouraged if your new rescue acts this way. You help them get over their nervousness and become the loving and happy pet they are supposed to be with these tips. A nervous cat will always shy away whenever you try to pet it on the head. It will spend most of its time hiding and you will also notice it walking with the legs bent low to the ground. It will also frequently lower its tail with the tip curved upward and twitch its ears. The nervousness also makes them groom excessively and in moments when the agitation is too much, they will groom to the point where bald spots will form on the back legs. It is normal for newly adopted cats to be initially nervous because of the new surroundings. However if the nervousness carries on for more than a few days, you might be forced to take the initiative and calm them to avoid the stress for both of you. Patience, love and some persistent training will be required to help your cat come out of its shell. Knowing the reasons behind your adopted cat’s nervousness can help you seek the appropriate treatment for them and refrain from blaming yourself in case attempts to help fail to bear fruit. There are many reasons why your cat could be nervous, sometimes its experiences from their past. It could be new surroundings or being removed from the shelter. Some cats might also be overwhelmed with the new surroundings because they probably aren’t used to being around people and living in a home; this is very common with former alley cats. And some cats are just more nervous than others. Close observation of your cat is an excellent tool to understanding what makes him/her feel nervous. The first step in reducing nervousness is providing the cat a safe place to hide, then some patience as they cat adjusts to their new home. Being loving and patient with your cat will make them more comfortable in their new home. There are some training techniques and medications you can give to help your cat quit the nervousness and adjust. When you bring your nervous cat home, prepare a small confined space where she can hide. It can be that corner where you have pushed off a few things to create space. Have everything a cat needs available in this space such as food, water, litter, a scratching post and some cozy material for them to sleep on. Ensure that the cat’s living space is comfortable because you will have to let them stay in that space for a few days or weeks until when they feel ready to venture to the rest of the house. You might be forced to use food bribes to lure them into spending time with you, but ensure that you give them these food treats on schedule to avoid fattening them up. Ensure that the food bribes are the kind that a cat will really like such as cooked chicken which will be an effective treat during training. Every time your cat makes progress, reward them so that they can link you to the great treats and feel more comfortable around you. Administer medications as directed by the vet to ease their anxiety. Also talk to your vet about other effective medications that may further help your cat. Talk to your cat in calm tones and pet them whenever they draw close. Give them a name and call them by it until they get used to it. Whenever they are afraid because a stranger is in the house or because of the loud cracks of thunder, talk to them in low soothing tones to calm them and pet them as much as you can. Plan Social Interactions. After your cat is comfortable moving around the house and feels at ease with everyone in the family, it is now time to introduce other people and other environments to them to enable them completely overcome their fear. Most cats will walk around confidently when it is just the family that they are accustomed to in the home, but when guests arrive; they cower and go into hiding. Introduce your frequently visiting guests to your cat. Food treats can work effectively in this situation too. Lure them into the room by offering food treats and have your guests feed the cat too but make sure they know that you are trying to help the cat overcome its nervousness. Also ensure that your guests like cats or don’t have anything against them, because cats are able to sense when negative vibe is coming from someone and will of course react negatively. Never push your cat too hard when you notice slow progress or their reluctance to interact with other people. Have patience, it might take several visits and more training for the cat to be at ease around strangers. Always remember to provide the basics for your cat such as food in their bowl and fresh water every day for them to drink. Ensure that their litter is frequently cleaned and their living space is clean. Remain relaxed around your cat, felines are very adept at sensing your moods and your emotional state can adversely affect your cat. Encourage other members of the family to help make the cat’s stay in the home more comfortable. A nervous cat need not stay nervous forever. Try these methods and help your feline transform from a wild alley cat into a calm and happy house pet. Oliver here urging all my feline and human friends to celebrate World Cat Day today. I asked my purrrsonal assistant to look up the origins of this fantastic feline holiday as I wanted to recognize the brilliant folks who started this tradition. But not all cats are as lucky as The Tribe of Five. We were all rescued and we know what it’s like not to have humans to care for you. I would live to see everyone celebrate World Cat Day by rescuing a feline who needs a home! So paws up to the humans who’ve brought us into their homes and I say …. Danke, Merci, Благодаря, Tak, Kiitos, Þakka þér fyrir, köszönöm, grazie, ..and all those other words that mean thanks and of course, the most important word of all……Meow!